Robinson, Sydjia T. - Groelle & Salmon P.A. 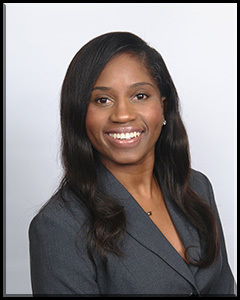 Sydjia T. Robinson is an associate attorney at Groelle Salmon P.A. Her practice areas include property and casualty claims as well as general and commercial litigation. Sydjia also has experience in foreclosure defense, probate, and appellate practice. Sydjia earned her law degree from the Barry University Dwayne O. Andreas School of Law in Orlando, Florida. During law school, Sydjia was a member of Trial Team and won an ABA-sponsored national trial competition. Sydjia also served as the treasurer for the Black Law Student Association and as a research assistant to Professor F.E. Guerra-Pujol. Prior to attending law school, Sydjia earned her Bachelor of Science degree in Exercise and Sports Science/Sports Management from the University of Florida. As an avid advocate for community service, Sydjia served as a volunteer at the Legal Aid Society for the Orange County Bar Association. Outside the office, Sydjia enjoys traveling, cross-stitching, reading, and spending time with her family. Born in Jamaica and raised in Tarpon Springs, Sydjia is happy to consider Florida her home. Barry University Dwayne O. Andreas School of Law, J.D.